The Dark Magic is the signature model of Andre Boulay, and a follow up of the popular Hitman from YoYoJam. Larger than the Hitman, the Dark Magic was designed to handle Andre's unique thumb grinds. Composite construction with YoYoJam's plastic with metal weight ring design. Adjustable gap, large diameter bearing, and hybrid response system, with Yo-Ring on one half and starburst on the other. 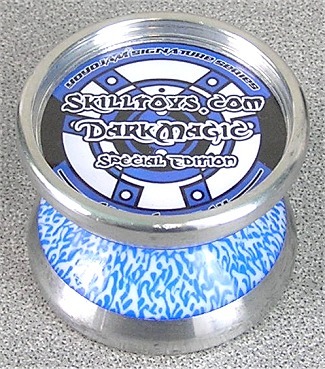 This is a very special release sold only by Skilltoys.com online store, sold at the 2005 National Yo-Yo Contest in 2005. The body of white Dark Magics were hand masked and dyed by CalicoJoe, Joseph Havrilla, creating the intricate designs. The special cap was made by YoYoJam for this release. Notice CalicoJoe's signature dyed on the inside, and designation that this was part of the Nationals run.